For many, the bathroom is a small room that can make a big difference in terms of overall comfort levels in the home. This is especially true for those who find solace in the shower or much-needed relaxation soaking in the tub. If you’re renovating or working on building your dream home, pay special attention to the flooring of your bathroom to make sure that it fits with your overall décor, mood, and wishes for the space. Are you trying to create a sanctuary for yourself and/or your spouse to unwind after a long day, or do you want a more family-friendly result? Different materials, colors, and patterns will have a huge stake in creating the overall mood and feel. If you have pets or kids, you’ll also want to consider the type of durability and longevity that different types of flooring can provide. One of the hardest parts of any renovation project is balancing your wishes with your budget. For those who want a more lavish, sophisticated final result, you may need to do some finagling with balancing the materials with how much money you can spend. In these cases, there are a lot of more budget-friendly options that can look like more expensive materials without the steep costs. 3. Do You Want to Be Eco-Friendly? Newer developments in the flooring industry have created a lot of opportunities to be eco-friendly while still achieving the look that you want. Eco-friendly options include concrete, pebble tiles, terrazzo, recycled glass tile, ceramic, and cork. And don’t forget – any of these materials can be great for other rooms too, so if you’re on the eco-friendly bandwagon then be sure to take advantage of all of your options. It’s surprising how wonderfully some good flooring can contribute to your overall design. For example, do you want a light, open, relaxing feel? This can be better accomplished using lighter colors to help open the room. A soft, marbled look can help create a more natural feel. For a more sharp and modern feel, darker colors with a slight texture or pattern can add sophistication and style. 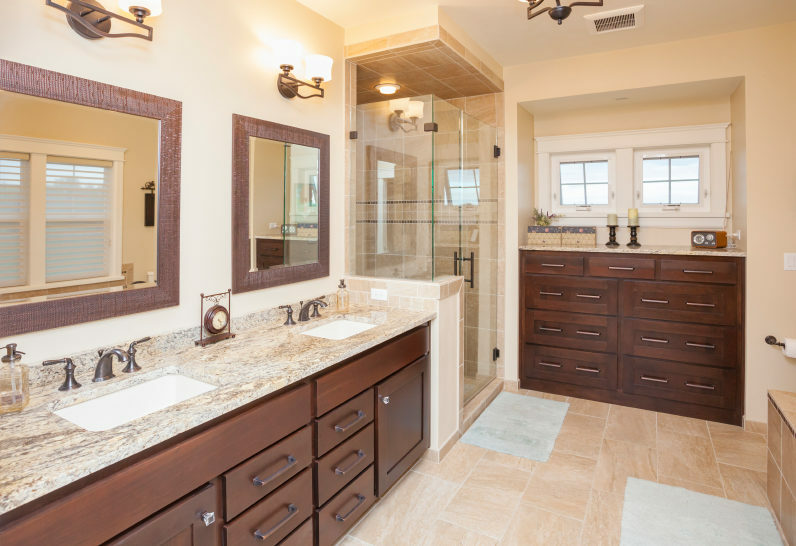 There are a lot of options for your bathroom flooring, so don’t hesitate to call a professional like the team at Flooring Headquarters if you need some guidance.